Find it annoying having to keep your bathroom clean when you trim your beard, mustache, or hair? 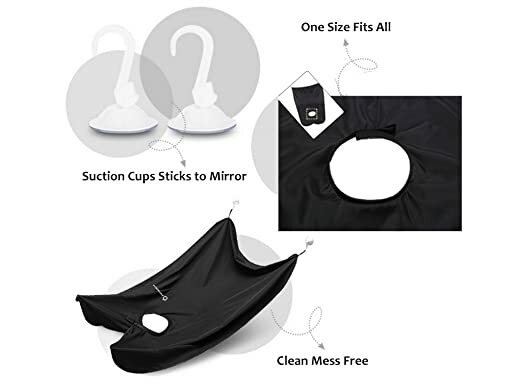 This three-foot square non-stick fabric attaches to your mirror and covers the sink and countertop while you’re grooming. When you’re done, the hairs slide off the nonstick surface and into the trash. No more hair everywhere. DON ‘T WORRY ABOUT CLOGGED SINKS & FLYING HAIR CLIPPINGS: Have fun shaping your beard the way you like it without thinking of cleaning afterward. Just stick our vacuum suction cups on your mirror and watch your hair collect on the beard catcher/apron for easy disposal. It is also machine-washable. ONE SIZE FITS ALL: The neck side has Velcro straps that you can adjust to your size. No strings and buttons to break. Just adjust your apron to your neck and you are ready to go!